Ananthabhadram (also spelled Anandabhadram; in Malayalam: അനന്തഭദ്രം ) - a Malayalam film released in 2005 about ghosts, spirits, and black magic, based on the award-winning novel of the same name by Sunil Parameswaran.. The file represents the first Malayalam venture of Indian director Santosh Sivan as well as of Bengali model/actress Riya Sen. The paintings of Raja Ravi Varma, Theyyam and Kathakali dance movements, and Kalaripayattu inspired Ananthabhadram. Ananthabhadram won five awards in the Kerala State Film Awards 2005, enjoying a commercial success as well. The venture constituted the first Malayalam feature screened using a satellite feed instead of conventional prints; aimed at an international market and released as a Ramadan special, dubbed in Tamil, Telugu (as Sivapuram), and English. 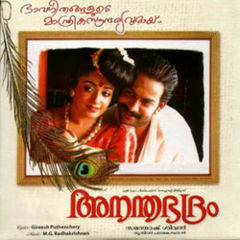 The release of Ananthabhadram in India followed that of horror movie Chandramukhi, starring Rajnikant, a remake of the Malayalam film Manichitrathazhu. Anathabhadram had been slated for Sabu Cyril as director and actress Meera Jasmine in the lead, but Shivan stepped in to replace Cyril when delays hit the production, first to a strike in the Malayalam film industry June 2004, and then because Cyril became busy with Shankar's film Anniyan. Cyril's assistant Sunil Babu art directed the film for Shivan. Like his earlier directorial ventures Asoka and The Terrorist (a.k.a. Malli), Sivan worked as the cinematographer for Anathabhadram. Kavya Madhavan replaced Meera as the female lead and gave a performance that established her as the top heroine of the Malayalam Film Industry that year, aided by both commercial success and critical acclaim. Prithviraj Sukumaran as the male lead also had his biggest success of 2005, out of the five films that year. Manoj K Jayan had been scripted with a sannyasin look with long hair in the proposed Sabu Cyril version, but sported a more contemporary look in the version that eventually filmed, winning much critical accolades. To get the right score for the film Sivan rejected Vidyasagar's work and appointed M. G. Radhakrishnan, who went on to win awards for the film's tracks—including the celebrated number Pinakkamano—and do the score for Sivapuram, the Telegu version of the film. Kathakali movements, magic spells, and special effects set the tone when Digambaran (Manoj K Jayan) abducts Bhama (Riya Sen). When asked about his inspiration for the film, Sivan said he "derived a great deal of inspiration from our arts. We have a rich visual culture and even in Ananthabhadram, I have used certain aspects from Theyyam dancers and Kathakali to create the wizard Digambaran's image. The color, long nails, kohl-lined eyes and so on were inspired from Theyyam and Kathakali." The sequence between Manoj K Jayan using Riya Sen as a channel for black magic, choreographed by Aparna Sindoor, the dance director of the film, uses Kathakali movements in particular, which has been an inspiration for major Indian films like director Shaji Karun's Vanaprastham (1999) and director Adoor Gopalakrishnan's Kalamandalam Ramankutty Nair (2005). The film also uses Kalaripayattu, the traditional martial art of South India, for the fight sequences between Digambaran and Chemban choreographed by action director Arash, following the footsteps of Kalari-based movies like Palattu Koman (1962), Thacholi Othenan (1964), Kannappanunni (1977) and Oru Vadakkan Veeragatha (1989), as well as famous martial art film actor Jackie Chan's The Myth. The film represents the second time the director has used Kalari (as known in popular coinage) in his films, the first time being in Asoka. Raja Ravi Varma's painting "Woman in thought"
The director used three paintings of Raja Ravi Varma—Damayanti and the swan, Lady in thought and Girl carrying milk tray—as inspiration to picturize the song Pinakkamano (acted by Prithviraj Sukumaran and Kavya Madhavan; sung by M. G. Sreekumar and Manjari). Sivan says, "Yes, it is a tribute to Raja Ravi Varma, who is so intrinsically etched in every Malayali's mind." That song came in the wake of a renewed interest in Varma's work in Indian showbiz, as evidenced in Indian pop star Phalguni Pathak's music video for the song Meri Chunar Ud Ud Jaaye (1998, acted by Trisha Krishnan) which emulated Varma's Shakuntala and Shaji Karun's declared film to be made on the artist's life which would feature Madhuri Dixit (actress of Gaja Gamini, a film by painter M.F. Hussain)., since the auction of the nineteenth-century painters work had been auctioned at Christie's and Sotheby's in late 1990s. The story of Ananthabhadram depicts a fairy tale. Set in rural Kerala, black magicians, martial arts experts, sorcerers and seductresses dominate the tale. Sivan said "it was the story of Ananthabhadram that captivated me. The stories my grandmother used to tell me used to take me to a world of mystery. It was the same feeling when I heard this story and I have tried to capture that in my film." Parameswaran says, "The fables that my grandmother narrated to me when I was a kid was there at the back of mind and that has been a source of my stories." The movie opens with little Ananthan hearing a tale from his mother (Revathi). She tells him that his family in the ancient village of Shivapuram comes from a line of powerful magicians. The family has the responsibility of protecting nagamanikyam (a jewel on the serpent's head), which lies in a secret place in the house guarded by snakes, including a tiny snake called Kunjootan. The real story begins when Ananthan (Prithviraj Sukumaran) returns to his ancestral village of Sivapuram from the United States to light the lamps at Shivakavu, a dark and mysterious temple of Shiva, obeying the long-standing wish of his dead mother. On his way home he meets Maravi Mathai (Cochin Hanifa), the story's comic relief, on the train. The local black magician Digambaran (Manoj K Jayan) opposes the lighting on the grounds of local superstitions to get his hands on the nagamanikyam, and disbeliever Ananthan meets the supernatural for the first time in his life. Chemban (Kalabhavan Mani), the blind martial arts expert, stands in Digambaran's way; the evil black magician manages to remove Chemban from his way, and leaves a trail of blood in his wake. Digambaran lures Chemban's sister and his lover Bhama (Riya Sen) in a series of sensuous and evil magical rites that feature a wide paraphernalia of the exotic, including Kathakali movements, traditional magic spells, special effects, and make-up artist Pattanam Rasheed's black-and-red face paints. Meanwhile, Ananthan's cousin Bhadra (Kavya Madhavan) falls for him and his light-hearted flirting, eventually leading to a commitment of love between them. In his effort to fit into the local environment, Ananthan wins the villagers' hearts by his easy kind manners; breached only when the magician takes over his mind for a short while. Bhadra faces the dilemma of choosing between Ananthan's love and becoming a Devi (goddess) in a mystical ritual of self-offering. In the end, Ananthan and Bhadra escape Digambaran's sinister tricks and unravel his conspiracy in front of the villagers, who always believed him a benevolent mystic. The fight to the end sees Digambaran destroyed and Ananthan restoring the nagamanikyam. In a year when most Malayalam films failed to recover costs, Ananthabhadram represented one of the few commercial successes, along with Rajamanickam, Chanthupottu, Naran, Thommanum Makkalum and Udayananu Tharam. Pinakkamano became the top hit among Malayalam film songs in 2005. The film inspired director KJ Bose's Tanthra (2006) featuring actors Siddique and Shweta Menon. Ananthabhadram won five awards in the Kerala State Film Awards for 2005, including Best Cinematgraphy (Santosh Sivan), Best Music Direction (MG Radhakrishnan), Best Editing (Sreekar Prasad), Best Art Direction (Sunil Babu) and Best Makeup (Pattanam Rasheed). It won five awards in the Kerala Film Critics Association Awards 2005, including Best Film, Best Director (Santhosh Sivan), Best Actor (Manoj K Jayan), and Best Cinematography (Santhosh Sivan). Sunil Babu, the art director, won critical acclaim for his work for the film. ↑ Ananthabhadram on Chennai Online, Chennai Online. Retrieved February 3, 2009. ↑ Riya Sen in Ananthabhadram. That's Malayalam. Retrieved February 3, 2009. ↑ Ananthabhadram screened using satellite technology. My Kerala. Retrieved February 3, 2009. ↑ Horror is the current flavour from the Hindu, The Hindu. Retrieved February 3, 2009. ↑ Sabu Cyril turns director. Kairalee. Retrieved February 3, 2009. ↑ Santosh Sivan to direct spooky film. Rediff Movies. Retrieved February 3, 2009. ↑ Anandabhadram review on Kerala Pals, keralapals.com. Retrieved February 3, 2009. ↑ Anandabhadram preview at Music India Online, MusicIndiaOnLine.com. Retrieved February 3, 2009. ↑ India Glitz Review of Sivapuram Soundtrack, IndiaGlitz.com . Retrieved February 3, 2009. ↑ Interview: Straight talk with Santhosh Sivan. Music India Online. Retrieved February 3, 2009. ↑ Vanaprastham. Keral. Retrieved February 3, 2009. ↑ Ananthabhadram. BizHat. Retrieved February 3, 2009. ↑ Payyamveli Chanthu: Early Preview, Helldesign . Retrieved February 3, 2009. ↑ Jackie Chan and the art of Kalaripayattu. Rediff Movies. Retrieved February 3, 2009. ↑ Gopakumar, R. Jackie Chan touch gives kalaripayattu a fillip. Deccan Herald. Retrieved February 3, 2009. ↑ Raja Ravi Varma's art makes song number one favourite. Now Running. Retrieved February 3, 2009. ↑ Newsmaker: Raja Ravi Varma. Varnachitram. Retrieved February 3, 2009. ↑ Women in Raja Ravi Varma Mold. Boloji. Retrieved February 3, 2009. ↑ Madhuri being sought to play a painter’s muse. Apun Ke Choice. Retrieved February 3, 2009. ↑ The return of Madhuri Dixit. Rediff News. Retrieved February 3, 2009. ↑ Shaji N Karun to make a Hindi film. Rediff Movies. Retrieved February 3, 2009. ↑ Raja Ravi Varma: Portrait of an Artist, Oxford University Press, May 5, 2006. Retrieved February 3, 2009. ↑ Chandran, Kilimanoor (1998). Ravi Varmayum Chitrakalayum. Kerala: Department of Culture. ↑ Raja Ravi Varma's art makes song number one favorite from Now Running, INFOCON LLC. Retrieved February 3, 2009. ↑ Kerala Film Critics Association 2005 Awards. Alternative Film Guide. Retrieved February 3, 2009. ↑ Casting a spell from the Hindu, The Hindu. Retrieved February 3, 2009. Bose, Mihir. Bollywood A History. Stroud, Gloucestershire [England]: Tempus Pub, 2006. ISBN 9780752428352. Dudrah, Rajinder Kumar. Bollywood Sociology Goes to the Movies. New Delhi: Sage, 2006. ISBN 9780761934608. Grummitt, Karsten, and Katharine Wright. Bollywood India's Film Industry. Leicester, U.K.: Dodona Research, 2001. ISBN 9781872025179. MDb user comments for Anandabhadram (2005). This page was last modified on 17 March 2016, at 16:23.